Downloadable Vita game, Escape Plan, gets better controls and new DLC. You know what's better than taking advantage of the Vita's unique control options? Not taking advantage of the Vita's unique control options. Like Lair before it, Escape Plan was a solid game that ended up being crippled by its own innovative control scheme. 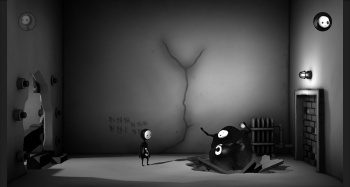 In the original version of the game, you had to guide two charming goo creatures out of a laboratory by poking your Vita, sliding your fingers across its screen or "squeezing" the front and back touch sensors. The problem was, the game was filled with insta-death traps, and while elegant in theory, in practice the control system was finicky and unpredictable. This is no longer an issue following the new 1.04 patch released today. The patch allows players to take control of Lil and Laarg by using the Vita's D-pad and buttons. The characters are still semi-autonomous, you'll have to press the d-pad to start them moving, then press it again to make them stop, but it sounds a lot more elegant than the touch screen solution. The patch also adds two new costumes for the two characters. It also coincides with the release of the new Director's Cut DLC, which adds 21 new stages and another two new costumes. The DLC will cost you $4.99, but the control patch is free. While the Vita is still desperate for new games, improvements to its existing catalog are always welcome.